Who-ee! These pics are of the growth that was to be surgically removed last Monday but the VET decided to take a blood test in the first instance and following the results of this the operation was re-scheduled for tomorrow. So no supper for me tonight. Bonnie purple heather - a beautiful place as well as a state of mind. Thanks to Oscar for a warning about the visit to surgery - I’ll keep my legs crossed. 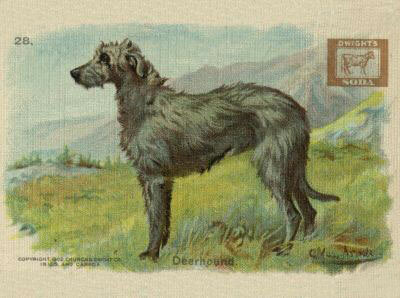 I found this little Deerhound Tammy (see the the picture) and thought of The Knit-fitt blog kept by Oscars Mistress. Perhaps Cate or one of her many knitting companions produced it. And with the ‘cauld heiland winter’ now heading our way, it would make the ideal headgear for my human companions to don whilst ‘oot on a frosty nichts walk wi’me’. I rekkon if it had been knitted with a grey Angora or Mohair wool it would give that Deerhound natural scruffiness, a little St Andrews Cross in blue and white for the hounds bonnet and scarf just like the Scotish Flag, the tammy would have been richt dandy! 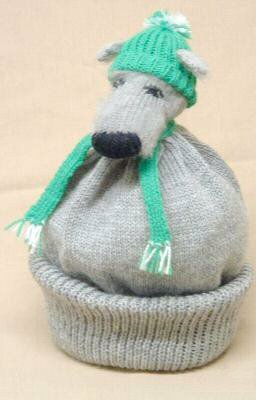 If any of Dogwood, Oscar and Moose’s knitting blogger friends can come up with three, I’ll buy them for the Winter. 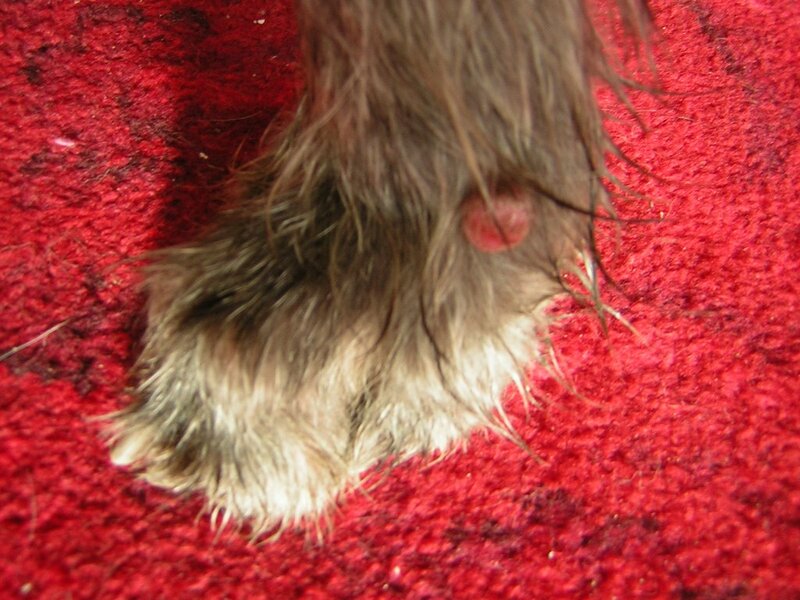 I went to the VET yesterday for my annual Booster inoculation - but my family had found a growth on one of my paws and requested it inspected - unfortunately it has to be removed by surgery and then sent to the Vetinary Lab for diagnosis. 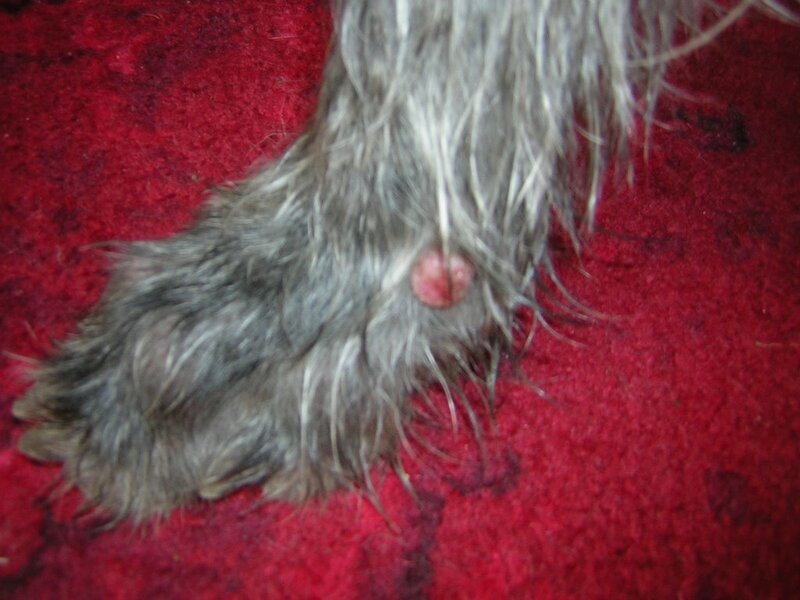 The Vet reckons it is a benign cyst, but it is in such a position on one of my knuckles that it could rupture during one of my many excited moments and and he recommends it best be removed to prevent later problems. So this coming Monday, I’m of to the surgery . . . help! The wonder of we hounds has to be finding what the human companion writes of us. Here I reproduce a poem penned by a true admirer indeed and published in several locations on the Internet. Who was the author? . . . let the Rogue know. Reproduced below is an intertesting folk song The Three Ravens, lifted from the Folk Songs of England, Scotland, Ireland and Wales. 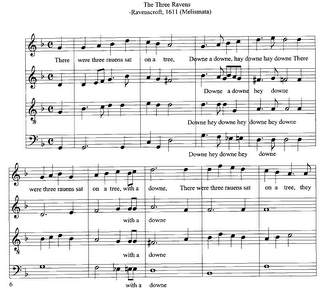 This ballad dates back to 1611 where it appears in Melismata. Musicall Phansies Fitting the Court, Cittie, and Countrey Humours by T. Ravenscroft. It is also known as The Twa Corbies. According to the The Viking Book of Folk Ballads of the English-Speaking World, the song deals with primitive superstition. "Perhaps in the folk mind the doe is the form the soul of a human mistress, now dead, has taken. Or it may be that the doe was considered an animal - paramour of the dead knight. Most probably the knight's beloved was understood to be an enchanted woman who was metamorphosed at certain times into an animal." Interestingly the knight was furnished with the compliment of loyal hunting houndes and hawkes according to the ballad and the houndes remain loyal even to their fallen master. A 15th Century story telling in verse of a dark-age event perhaps? 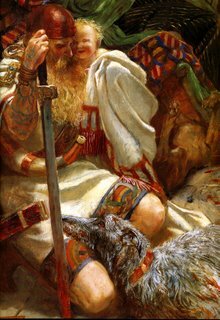 Did the warrior beneath shield relate to the Norse people? Was the verse of the Scottish Borders where tales of hunting, and wars because of the hunt are known to have taken place? Where Viking Clans were known to have invaded and settled. 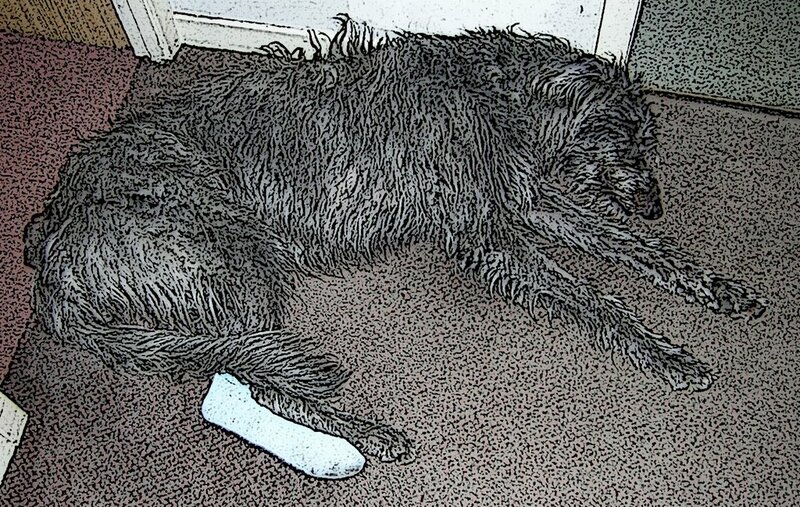 The Rogue Deerhound historical investigations are still very much ongoing and fun. Such hawkes, such houndes, and such a leman. and if you wish to perform the song . . . I don’t often wander offsite into the world of non deerhound videos, but today to commiserate the Scotland Football teams hard fought defeat - Scotland 0, Ukraine 2 in Kiev yesterday, I have decided to post up one of the many available cigarette card illustrations of deerhounds to lift the spirits. I have also decided to post one of the most fabulous of animal moments captured on video. The suroundings do not look all that natural or comfortable in the video, but hopefully this is to protect the mother and cub and return this animal into a wider existence and out danger of extinction as was achieved with my own breed. This painting is a wonderfully romantic Victorian era work by the artist (John) Byam (Liston) Shaw (1872-1919). An artist clearly influenced by the Pre-Raphaelites. Some of his other works are among my favourites and it would be all to easy to growl off on a happy highland hound tangent about these other works, but instead I will concentrate more on the painting opposite. What’s of interest for deerhounds and their owners must be the subject matter of the above work, entitled 'Who Knoweth the Spirit of Man...'. Based on the folktale featuring yet another hound of Legend . . . Gellert. The artist depicts the hound to be what we now know as a deerhound, similarly the garb of the Prince including his sword, helmet and indeed, blue warrior paint is portrayed in the dark-ages style, descript of the Pictish warrior. Interestingly, a type of Welsh language is believed to have been spoken as wide spread as Wales to the Kingdom of Fife in Scotland. And also, another Legendary figure is now thought to have ruled this area as King, that king being King Arthur (more on this in future blogs). Back to the blog at hand . . . we can draw conclusions from the painting and the period of it’s creation, that influence was probably garnered from the regenerated interest in the Highlands of Scotland, brought about not leastly by Queen Victoria herself. This is likely to have had effect on the appearance or choice of the dog used as a figure within the portrait. 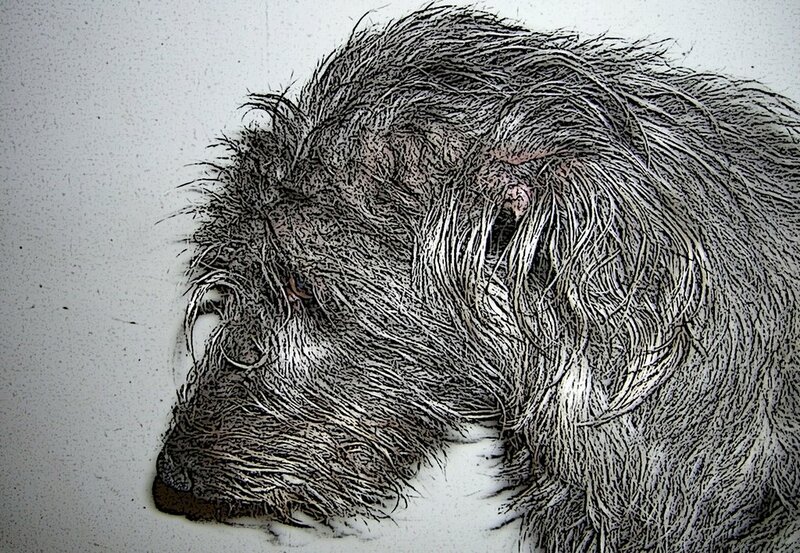 Yes, the ancient rough coated grey hound of the north, now known as the deerhound. For those that do not know the tale, it is included below and one would think that it would serve as a clear lesson for those who are forcing society into a rush of reaction, before the establishing of true facts. A lesson that Kings, Princes and Rulers of their Worlds fail to learn again and again, thereby allowing the tale to be reborn continually. 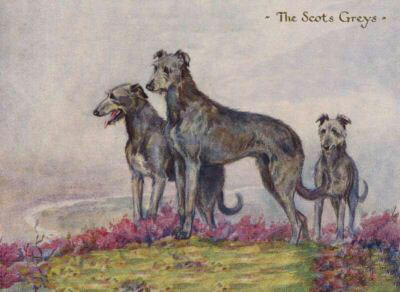 The moral aside, it is possible from the tale that the hound temperament could be from a hound of the deerhound line. Read on . . . 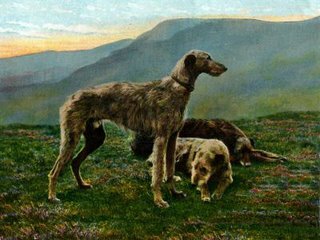 Prince Llewellyn had a favorite greyhound named Gellert that had been given to him by his father-in-law, King John. He was as gentle as a lamb at home but a lion in the chase. One day Llewellyn went to the chase and blew his horn in front of his castle. All his other dogs came to the call but Gellert never answered it. So he blew a louder blast on his horn and called Gellert by name, but still the greyhound did not come. At last Prince Llewellyn could wait no longer and went off to the hunt without Gellert. 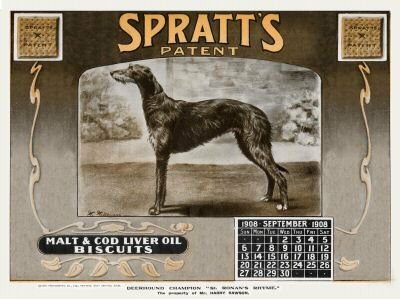 He had little sport that day because Gellert was not there, the swiftest and boldest of his hounds. He turned back in a rage to his castle, and as he came to the gate, who should he see but Gellert come bounding out to meet him. But when the hound came near him, the prince was startled to see that his lips and fangs were dripping with blood. Llewellyn started back and the greyhound crouched down at his feet as if surprised or afraid at the way his master greeted him. Now Prince Llewellyn had a little son a year old with whom Gellert used to play, and a terrible thought crossed the prince's mind that made him rush towards the child's nursery. And the nearer he came the more blood and disorder he found about the rooms. He rushed into it and found the child's cradle overturned and daubed with blood. Prince Llewellyn grew more and more terrified, and sought for his little son everywhere. He could find him nowhere but only signs of some terrible conflict in which much blood had been shed. At last he felt sure the dog had destroyed his child, and shouting to Gellert, "Monster, thou hast devoured my child," he drew out his sword and plunged it in the greyhound's side, who fell with a deep yell and still gazing in his master's eyes. As Gellert raised his dying yell, a little child's cry answered it from beneath the cradle, and there Llewellyn found his child unharmed and just awakened from sleep. But just beside him lay the body of a great gaunt wolf all torn to pieces and covered with blood. Too late, Llewellyn learned what had happened while he was away. Gellert had stayed behind to guard the child and had fought and slain the wolf that had tried to destroy Llewellyn's heir. 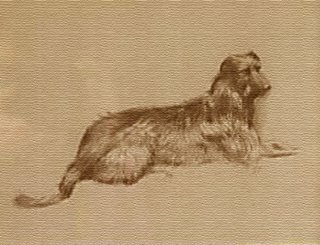 In vain was all Llewellyn's grief; he could not bring his faithful dog to life again. So he buried him outside the castle walls within sight of the great mountain of Snowdon, where every passerby might see his grave, and raised over it a great cairn of stones. And to this day the place is called Beth Gellert, or the Grave of Gellert. The above source comes from: Joseph Jacobs, Celtic Fairy Tales (London: David Nutt, 1892), no. 21, pp. 192-194. Jacobs' source: "Beth Gêlert, or the Grave of the Greyhound," a poem by W. R. Spencer privately printed as a broadsheet in 1800. A note by Spencer: "The story of this ballad is traditionary in a village at the foot of Snowdon where Llewellyn the Great had a house. 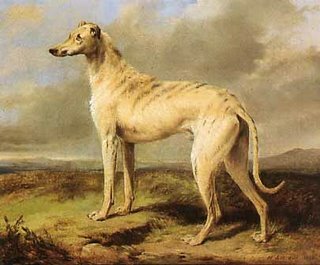 The Greyhound named Gêlert was given him by his father-in-law, King John, in the year 1205, and the place to this day is called Beth-Gêlert, or the grave of Gêlert." The modern Welsh spelling of the place where Llewellyn's dog is buried is Beddgelert. Today, Hangover Scotland for Deerhounds everywhere! Yesterday, Scotlands Football Team as good as won the World Cup, with a fantastic victory over the Auld Alliance - France. Scotland, as usual has the most difficult of qualifying groups for the European Championship, named the Group of Death - and today the table stands with Scotland at the Top. and Faroe Islands nil pts. We know we have it all to do, but for today, we celebrate. And so I quench my thirst in Europes largest fresh water location - Loch Awe - to wash away the fog of last nights over indulgence, when it would almost be impossible to have not heard . 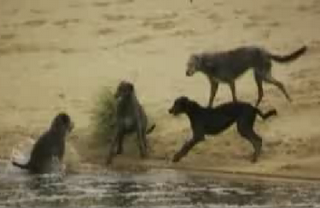 . .
A rather old but interesting little deerhound video, googled up for deerhound fans everywhere. From Finland. Here is an interesting clip - I’m sure there’s not a deerhound out there who hasn’t watched this little scene. A question. 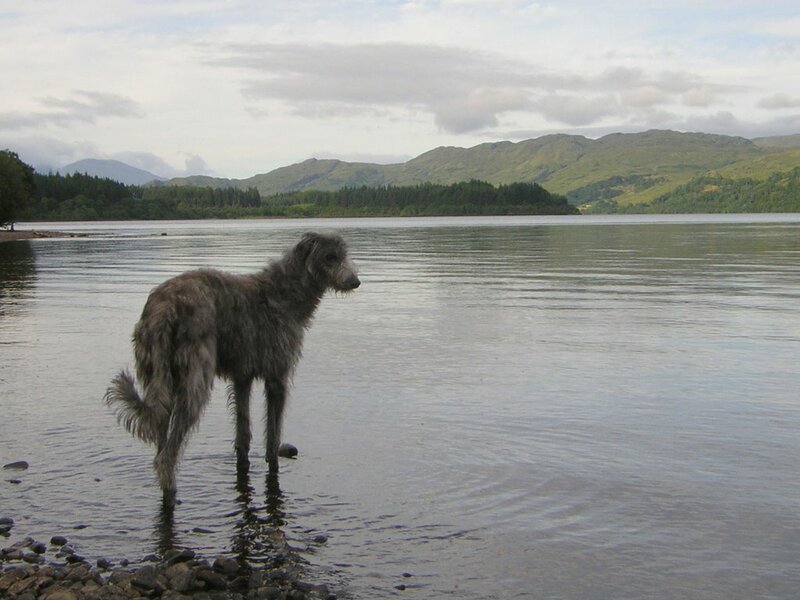 How did that young lad ever manage to outrun deerhounds?, this is surely a secret only superman would know. From the Robin of Sherwood movie starring Kevin Costner this segment was filmed at the famous Hadrians Wall. The wall constructed to keep the marauding blue ‘Pechti’ from setting about the Roman Legionaires some centuries before, and we know the Picts as recorded by the Romans brought their hounds into battle with them - but this is another story. Back to good old Robin Hood - Outlaw in a fight against poverty - he would be as much at home in the world today as he was of his period. Click the link to find out more about this figure of folklore and enjoy the movie excerpt above. Great grey gazehoundes do your stuff!